Solution: An unknown alkene gives propanal as the only product upon ozonolysis (reductive workup). When the unknown is treated with bromine in carbon tetrachloride, an optically inactive dibromide is formed, which cannot be resolved into enantiomers. Which of these alkenes is consistent with this data? An unknown alkene gives propanal as the only product upon ozonolysis (reductive workup). When the unknown is treated with bromine in carbon tetrachloride, an optically inactive dibromide is formed, which cannot be resolved into enantiomers. 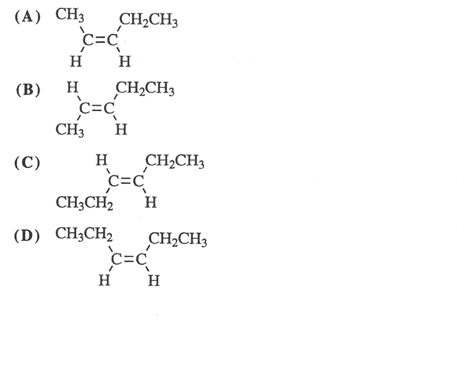 Which of these alkenes is consistent with this data?